Tight rations? Life can be tough when you’re a horse. Is your horse struggling to lose weight on a diet? It’s possible you might have to take the blame. American researchers set out to investigate weight-loss management in client-owned horses. The North Carolina study team set out to determine if a reduction in body weight and body condition score could be achieved among privately owned and managed horses through a 10% to 20% energy restriction. They wanted to see if similar results could be achieved to those recorded in a previously published study involving horses placed on similar diets, but in a controlled research setting. 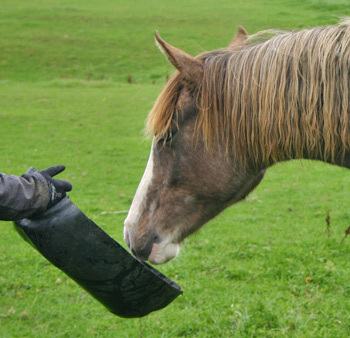 North Carolina State University researcher Jennifer Gill and her colleagues found that the horses did indeed lose weight, but the best results were achieved in horses whose owners dug deep to show some tough love and stuck with the tight feeding regime. The owners of 24 horses were prescribed diets for their overweight animals. The horses were on the weight-loss program for an average of 26 weeks. In addition, four control horses were used in the study. The researchers found that the horses on diets lost an average of 5.98% of their original body weight on the diets, and their body condition scores fell by an average of 1.4. The horses were evaluated on a range of measures in September 2012 before starting their diets, and then reassessed six months later to determine the results. They found that horses with more compliant owners had greater average decreases in body weight and body condition score than those of non-compliant owners. “Likewise, horses with no pasture access had a greater mean decrease in body weight and body condition score compared to continuously grazing horses,” they reported in the Journal of Equine Veterinary Science. Results suggested that a 10%-20% restriction in energy intake can successfully be implemented in client-owned horses, resulting in weight loss, provided the owner was prepared to make the feed reductions necessary. J.C. Gill, S.E. Pratt-Phillips, R. Mansmann, P.D. Siciliano.